My current pest control company one year pay in advance contract is coming up for renewal. 1) Outer perimeter treatment. This can be done by just spraying (Demon WP is the most popular, I prefer FastCap for spiders), and by also using a combination of granular insecticides, and possibly dusting the weepholes, cracks, crevices, etc. All of this is done within 2-3 feet of the outer wall of the house. Basically just start at the front door, walk backwards, and treat as you walk. Spray 1 foot up and 1 - 2 feet out from the house saturating the soil or grass. If you apply granules and dust, then you will need to make applications for each of these also. The outer perimeter treatment is also what is usually done on monthly or quarterly visits. Most pest companies have quit doing anything inside unless there is a pest issue. 2) Inside treatment. This treatment varies, but here is what I recommend for spiders. Apply a very light application of Fastcap, Demon WP, Demand, Suspend, etc, in the corners of rooms, under furniture, storage areas, garage and places where spiders could hide. This is done by using a pump hand sprayer and mixing in your favorite pesticide (Demon Wp for example). Don't spray it on open baseboards, and don't spray it on hardwood floors, linoleum, tile, etc. After this treatment is performed, use ePest IPM Sticky Bug Traps, and place them under furniture, in storage closets, etc. 1 per room is sufficient. Treatment of the attic using an insecticide dust such as Cimexa or Delta Dust is optional. I normally don't recomment it as most spiders are looking for insects which live in cool moist places. That's it. This is what your pest company will do, usually in 15 minutes or less and charge you upwards of $100 for. You can do all of this yourself for only a few dollars per treatment, and usually get better results, because you will use more chemical. The BIG National pest companies schedule around 18-20 jobs per day for their techs. How much time do you think they really spend at your home? 15 minutes or less, and that includes doing the paperwork. 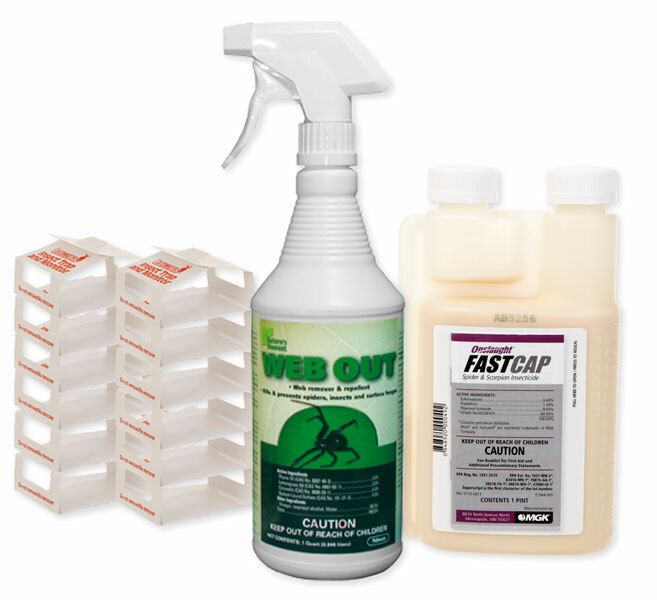 We have a kit that contains FastCap insecticide, Web Out, Surrender Granules, ePest Bug Traps. Sprayer is optional. This kit does a great job and contains enough spray to treat your house 32 times (average house). That is a bargain. Here is the kit - Click here. Use this kit for the inside and outside on the first treatment, then do the outer perimeter every 2-3 months. Inside after that as needed only. Now get to killing those spiders!